What is your favourite type of cake? For me, the answer is chocolate cake. 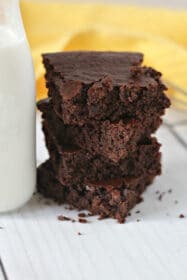 I’m not fussy about the type of chocolate cake though, as it could be this flourless chocolate orange cake, or this sticky chocolate cake, or this lighter and fluffier style of chocolate cake. It just needs to be brimming with that rich chocolate flavour, without being too rich or sickly, and definitely not dry and crumbly. Armed with a slice of chocolate cake and a cup of tea and I’m one happy girl. As far as my husband goes his favourite type of cake is apple cake. Over the years I’ve made a number of different apple cakes, some fancy, some more on the plain side, which, is my husband’s preference. And while the other apple cakes have been perfectly fine, delicious even, the search for what I consider to be the ultimate apple cake continues. My latest foray into the apple cake world is this beautiful spiced Apple Cider Cake. It’s brimming with apples, both pureed and incorporated into the cake batter, and wantonly peeking out of the top of the cake. It also has that rustic look, as I think any good apple cake should. This apple cider cake begins by bathing slices of apple in a bubbling combination of apple cider, caster sugar, vanilla and cinnamon, which are left to cook for a few minutes before being set aside to cool. Then one-third of the apples are pureed, ready to be incorporated into the cake batter, and the remaining apples reserved for the top of the cake. The apple cider cake itself is quite a simple yoghurt cake, and while I’ve used regular white flour here, I think a wholemeal version would also be beautiful. While the cake is baking the remaining soaking liquid is reduced and kept warm to drizzle over the top of the cake the minute it comes out of the oven. 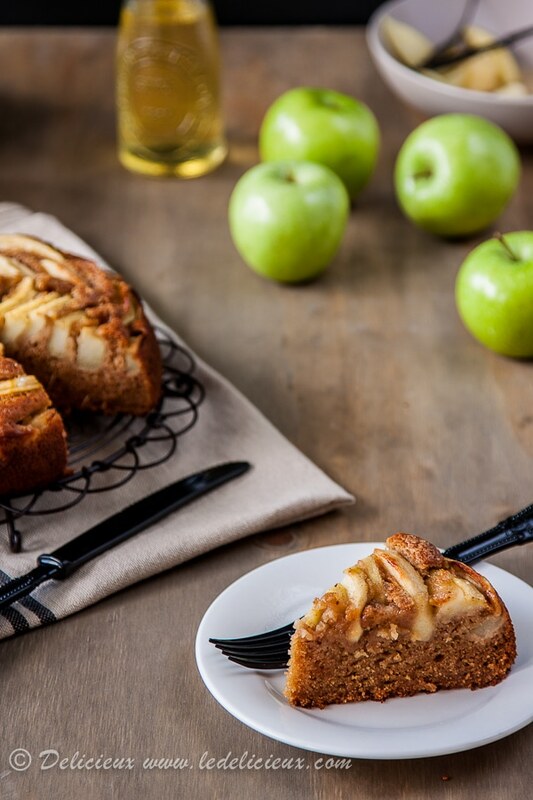 The result is a beautiful sticky moist apple topping with a delicious spicy cake base. So tell me, what is your favourite type of cake? And do you have an amazing apple cake recipe? If so, I’d love to hear about it. A wonderfully moist cake packed with apples, apple cider and spices. Start by making the apple topping. Place the apple cider and caster sugar in a saucepan and place over a low heat. Stir until the sugar has dissolved and turn the heat up to high and bring to a boil. Add vanilla seeds and pod, cinnamon quill and apple pieces and reduce to a simmer. Simmer for 3 to 4 minutes or until the apples are just tender. Remove from the heat and set aside to cool. Once the apples are cool puree 1/3 of the apple mixture in a blender or food processor and set aside. To make the cake, preheat the oven to 180 celsius (350 fahrenheit) and place the butter and brown sugar in a bowl of an electric mixer and cream until pale and golden. Add the eggs, one at a time, beating well between each addition before adding the apple puree. Sift the flour, baking soda, baking powder and spices, and fold through. Finally add the Greek yoghurt and mix until just combined. Place the mixture into a 22cm round non stick spring form tin that has been lined with baking paper and spread until smooth. Starting from the middle, place the apple pieces in a circle and repeat until the whole cake is covered. Bake for 30 to 35 minutes, or until a cake tester comes out cleanly. minutes before the cake is ready take the remaining apple cider and place over a high heat and bring to a boil. Reduce to a simmer and simmer for 10 minutes until the syrup has reduced and become more golden in colour. When the cake comes out of the oven drizzle the top of the cake with the apple cider syrup and leave to cool before serving. Need to convert something? Check out my conversion chart here. It doesn’t say in the recipe if you drain the apples that have been cooked in cider before you purée – do you use half of the apples AND liquid, or drain before halving? I don’t like cakes that are cloyingly sweet – so this one is right up my street. It helps that your photos are so sumptuous too! Thank you Nancy 🙂 I hope you enjoy the cake! 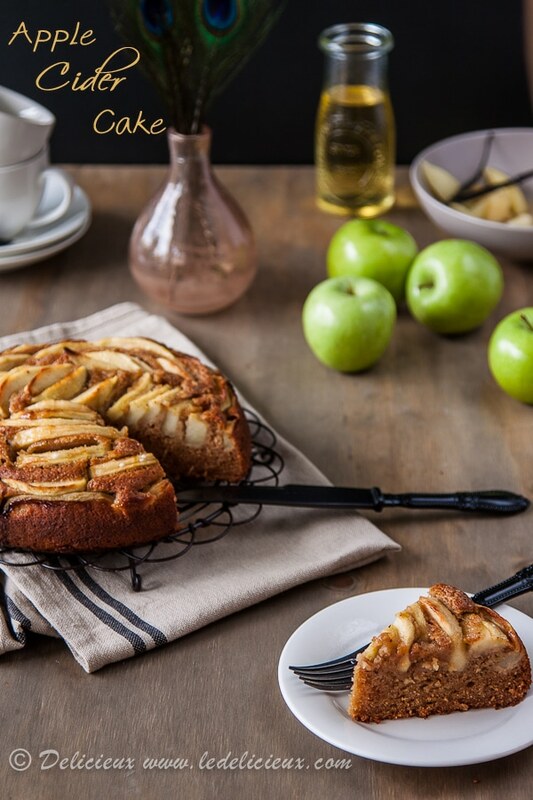 I have made a few apple cakes but this one I particularly like the look of – I will give it a try! I’m bookmarking this and trying this at home! I’m literally in a lunge position now…I want to attack this cake! So mouthwatering…! I like the way you placed the apple slices, too! Like a rosette – so cute! That is a beautiful looking apple cake. From what I see on the list of ingredients this would be a lovely variation from what I tried so far. I especially like the use of cardamon and Greek yogurt. I love the sound of this cake, particularly since I love anything with apple in it. 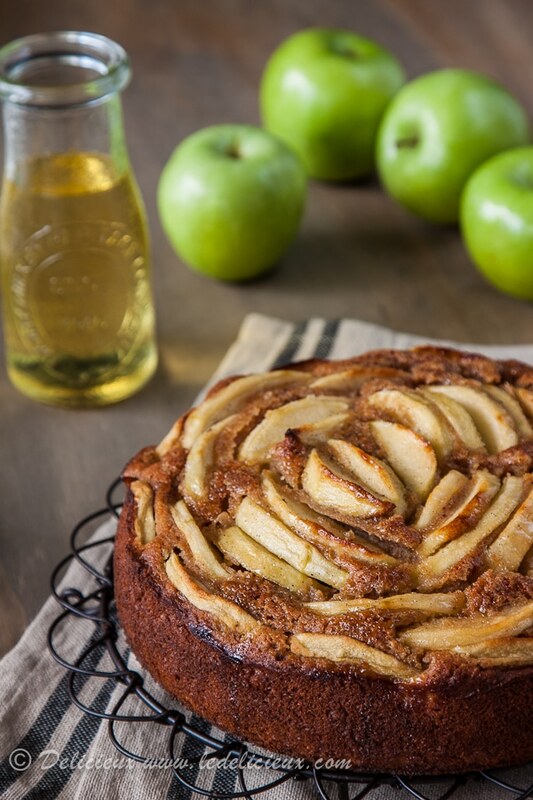 I love the use of cider in this cake – it sounds quite unusual but it must give the apples a wonderful flavour. It’s hard for me to choose a favourite type of cake, but I do tend towards plain cakes or crumble cakes. One of my favorite cake recipes is for a spiced chocolate cake. Its really simple and made with oil as the fat so you just throw all the ingredients into a mixer (ok you have to melt the chocolate first), bake it and slather it in chocolate butter cream. A gorgeous cake and something, although I do love a good chocolate cake, something different is called for. I love that this has so much apple goodness in it and the top must be so deliciously sticky! 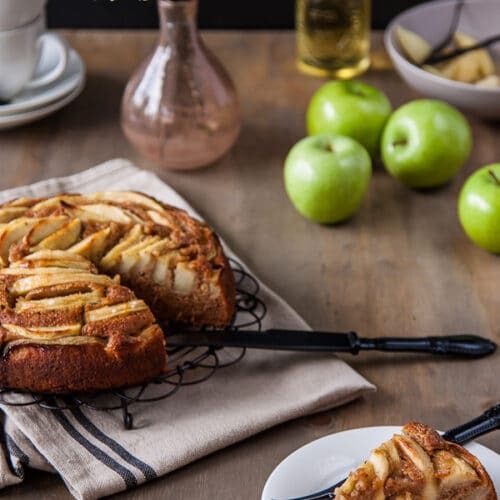 I love apple cakes, this one looks especially lovely! This sounds like it would go brilliantly with a cup of Lapsang Souchong! I love any cake with chocolate or spices. Your apple cider cake is just my sort of thing! I really look forward to making it. I’m a chocolate cake lover too but this looks divine – I love that photo with the thick cut slice and beautiful apples on top. Just gorgeous. Ooh it looks so golden and delicious. I wouldn’t mind a slice with my tea right now. Chocolate is my favorite too, but this looks amazing! I have such a sweet tooth, so it’s hard for me to pick one cake, but if I had to, it would be a chocolate layer cake with chocolate icing (and a big glass of cold milk). Simply perfect. When it comes to cakes, I am not really an expert, so I stick to the good old apple pie. But I like your recipe, just lovely! Mmm I just love apple cakes but I think I’m with you that chocolate is the best!! hehe. Love that crust on this Jennifer, and the moist crumb on the inside. It screams to be eaten! My favourite cake, it would probably have to be carrot cake, or a good tiramisu with cream instead of mascarpone. Yes, lots of creammmm…. and that’s what I’d serve this baby with! This cake really does sound delicious and it looks beautiful – such stunning pictures! 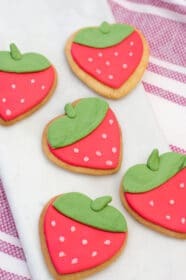 A delicious treat, I’m sure! I am a sucker for apple cakes. Nice clicks and lovely presentation/props. WOW! I am not a baker per se! But the apple and cinnamon combination would make anyone’s day! I agree, apple and cinnamon is such a great combination. I love cardamon and cloves with apples too.